Roosevelt Island is a small narrow island between Manhattan and Queens. It’s about 2 miles long and no more than 800 feet wide at any point. Although completely separated by water, it belongs to the borough of Manhattan. There’s no more than 20,000 people living on this island, and there is exactly one Starbucks servicing them all. In the 1800s the city of New York bought the island and used it to keep prisoners and the mentally ill. 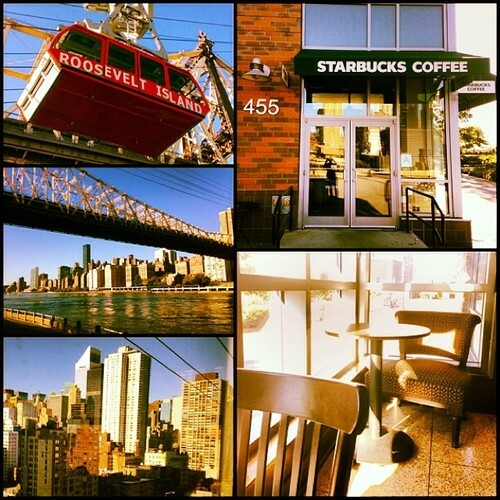 The easiest way onto the island from Manhattan is using the Roosevelt Island Tram from 60th street and 2nd Avenue. It’ll cost you $2.50 each way. If you’ve ever seen the first Spider-Man movie with Tobey Maguire, you may remember seeing Spider-Man rescue dozens of people from the dangling from the tram. Until 1989 the tram was the only way to access Roosevelt Island from Manhattan. Then the F-train came along. The only way to get a car or truck onto the island is from Queens using the Roosevelt Island Bridge. If you’ve ever seen the first Spider-Man movie with Tobey Maguire, you may remember seeing Spider-Man rescue dozens of people from the dangling from the Roosevelt Island Tram. Okay — enough about the island, I know you’re dying to hear about its only Starbucks. The best way I can describe this Starbucks is that it in no way resembles your typical NYC Starbucks. If anything, it reminds me of some of my favorite Florida Starbucks. Meaning, there is just as much outdoor seating as there is indoors. In fact, you would probably prefer to sit outside — there’s quite the view. The Starbucks is surrounded by shrubs and green grass, and unless you look across to Manhattan you almost forget where you are. At least until you notice that this Starbucks has only one unisex restroom — and then it all comes back to you. So if you’re a New Yorker living on Roosevelt Island, congrats! You’ve got yourself a great Starbucks. And if you’re a New Yorker who has yet to visit the island, I’d recommend you make the trip. Take the tram. See the views. Grab a coffee.